Even while Giles was internally puzzling over how he might carry off the daunting task of finding a wife while living with his cousin's family, the solution to his conundrum was merrily padding up the stairs in the form of Miss Frieda Baybrace. After the baby was born, Frieda had gone down to relax in the spa. It seemed that the birth was harder on her than it had been on Barry's mother! But when she heard that a distant relative was visiting, she wanted to meet him and rushed upstairs to accomplish this goal. Now Frieda has many interesting personality quirks, but shyness is nowhere among them. It's not that she intentionally greeted Giles clad in nought but a dripping wet thong and the rare multichromatic censor snake; it's just that it never occurred to her that perhaps she ought to don some clothing before meeting Greg's out-of-town cousin. So we shouldn't be surprised that his first sight of Frieda had quite an impact on Giles. It would not be at all inaccurate to say that when he encountered her sparkling eyes and winning smile (and perhaps other charms), his brains turned to oatmeal in less time than it takes to tell about it. Originally posted Fri May 13, 2005 1:27 pm at the Hullabaloo. When Frieda suggested that they leave mom and dad to get to know their new baby, and retire to the patio where she and Giles might get to know each other better, Giles was eager to agree. In truth, he was quite aware that at that moment, he would have followed that thong anywhere! Originally posted Fri May 13, 2005 1:34 pm at the Hullabaloo. The magic of Happy Valley runs in full force out on the patio of Manse Orleans, and soon the two found themselves hopelessly in love. Giles quickly discovered that while a kiss may be just a kiss and a smile may be just a smile, kissing an almost-naked, smiling young lady can be an adventure all its own! Originally posted Fri May 13, 2005 1:39 pm at the Hullabaloo. People often told Giles that he was dangerously impetuous, while he thought of himself as being decisive. While lesser mortals would have dithered over the decision for months or even years, Giles reached a major life's decision in mere minutes. And so, on his first day in Happy Valley, on the day that is cousin Barry was born, the day that he first met his cousin Greg and their extended family, and the very day that he met Miss Frieda Baybrace, he determined that he would make her his wife. He didn't need to know more about Frieda than he already knew. After all, considering her apparel, what secrets could she be hiding? Now, to say that Frieda was quite taken with Giles would be quite the understatement, but when he surprised her with a diamond ring on that fateful night, she eagerly accepted his proposal. Besides the love that had overwhelmed her the moment she first set eyes upon him, Frieda had reasons of her own not to hesitate in making such a major move in her life. Frieda did, indeed, have secrets that she had kept to herself for a very long time. Originally posted Fri May 13, 2005 1:51 pm at the Hullabaloo. Now, just before she accepted the engagement ring, Frieda held Giles close and whispered her deep, dark secret to him. She feared that he would be put off, that she would have spoiled their whirlwind relationship just as it was getting started. But Frieda was only just getting to know Giles. Not at all deterred by Frieda's secret, he said, "All the more reason for us to press on! Let's get married tonight!" And so, that very night, in a very private (and very informal*) ceremony, Giles and Frieda exchanged their wedding vows. It was the beginning of a happy partnership that would last beyond a lifetime and touch the lives of people all around the globe. *The groom was resplendent in informal black. The bride wore white, but only in the regions between her tan lines. Originally posted Fri May 13, 2005 2:06 pm at the Hullabaloo. Oblivious to the momentous events taking place on the patio, events inside Manse Orleans proceeded with abnormal domestic tranquility. 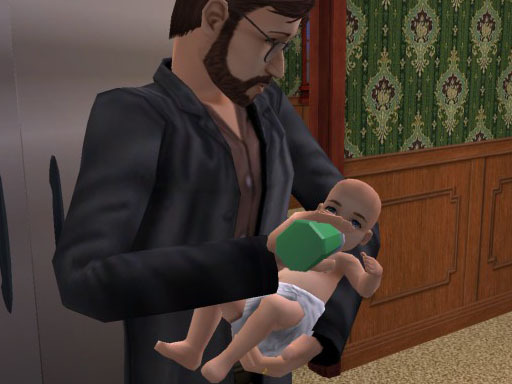 She seemed to be feeling quite pensive, perhaps coping with a mild case of post-partum depression, so Gregsim took over caring for baby Barry. Like all of Greg's children, Barry was a very affectionate child. He wanted a lot of cuddling, and of course his dad was happy to tap an endless supply of hugs for the youngster. Even before the night was through, their bonding was complete and Barry was best friends with his father. Finally it was time to put the little tyke down for a long night's rest. 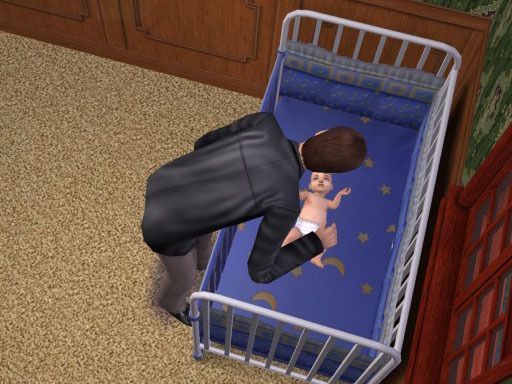 Greg reluctantly laid Barry in his crib and said goodnight, knowing that like all his children, baby Barry would sleep soundly* until he was awakened by the morning light. Finally! Some Time for Themselves! With the kids all safely snuggled in their beds and their house guest busy with his new girlfriend out on the patio, Greg finally had some time for Her. While they were happily snuggling on the love seat, She brought up the subject that had been on her mind all evening. "Sweetie, I really miss the girls, now that they're away at the university, and I always wanted to go to college myself." "Me, too," he agreed. "They keep offering me assistantships. They'd pay me to teach while I'm taking a degree." He chuckled. "As if we needed the money! We'd end donating the money for our assistantships!" "I know. It's just their way of making sure you know they are sincere about wanting you to teach there. So, I was thinking, maybe we could go? Now that Giles is here, he could take care of Manse Orleans for us; and I really think he'd like us out from underfoot so that he can pursue young ladies. Do you think we could be on campus without cramping the girls' style?" With a happy snort, he said, "Since when have we ever cramped their style? But I know what you mean. We couldn't move into that big house that we built for them on campus. That would be way too much of parental presence! We might find a place nearby, though. Our own place. There's no way I'm going to live in a dorm, not even one of those urban palaces that Tommy's boy has been building." He nuzzled her for a moment while he was thinking. "Darn, I can't think of any place near campus that would really do. I think we'd have to send the construction crew down and build our own place!" She hugged him and squealed with delight. "What?" he asked, but she just grinned at him. "All right! Pax! Let me breathe! King's X! I'll tell you!" "Well, it's just that I'm happy you are thinking that way, because I already sent Gloria down to the campus to buy some dirt!" She has dozens of friends in and around Happy Valley, and most of them are best friends, but first and foremost among them is her friend, confessor, advisor, and most trusted operative, the thoroughly angelic Miss Gloria Baybrace. Whenever She needs something done and doesn't want to bug anybody in Her husband's organization, She calls on Gloria. It's an arrangement that suits Gloria quite well. In addition to the fact that Gloria is extraordinarily and unabashedly fond of Her, these assignments give her lots amusing adventures and extra money to supplement her income as a medical technician. Gloria found herself at a crossroads. She enjoyed her med tech job, but even more, she enjoyed working for Her. Then they built Happy Valley University. She really, really wanted to go to college where she could learn more about the world and advance her career, but she didn't want to give up Her adventures. Neither Gloria nor She were quite aware that the perfect solution to this conundrum was already a-brewing in both of their minds until they discussed it, just three days before Barry was born. Gloria is Frieda's sister. They and five other sisters were originally born in the Babe Race (get it? ), a spoof of the Baby Race, which tragically was lost forever in The Bomb. The characters survived in transit in an empty household and have since gone on to become solid citizens of Happy Valley. Even their opportunistic brother, Billy Ray Baybrace, pops up once in a while. "So, how's the baby? Frieda said she'd be there to help out any time you need her." "It should be any time now, but I don't know when this little guy is going to launch! He seems to like it right where he is!" A merry laugh escaped Gloria's lips. "It sounds like he takes after his father already!" "Oh, that's terrible!" She said. "I love it!" "We're so bad. We really should be ashamed of ourselves!" "And the chances of that happening are?" "Somewhere between abysmal and that proverbial snowball! Bad forever! Or at least as long as the guys don't find out!" "Speaking of the guys not finding out..."
"Uh huh. You mean The Guy in particular." "I'm on it, She! What do you need me to do?" "Yes! That's my final answer! But we're not there yet. Let's start with... Huh? I was thinking about doing that, but I really like my job here, and I'd miss you--"
"That's only part of it. I want you to go down to the campus town and buy a big chunk of land, the bigger the better as long as it's close in, preferably close to my girls. Then get those architects from the Pearl Construction Company drawing up plans for a big house." "Huge. Big enough to be converted to a dorm or a frat house when we're done with it." "You'll make a mint off of that! Rents are sky-high on campus!" "Yup. That's the long-range strategy, but right now I want a big house on campus, and I want you in it. I need an on-campus operative, and you're what I want." "I love the idea, but what kind of house do you really want? I don't need a big house just to represent you on campus. You're up to something, and it involves him, which is why you don't want him to know!" "You're good, Gloria! That's why I need you!" "Aw, I just thought you loved me for my peach cobbler!" "I love you for lots of reasons! But right now I need you because you can get this done, and I'll need you on campus. He's going back to school!" "But he just doesn't know it yet, right?" "Right! He'll decide it's time to do that just as soon as the baby is born and I can get somebody to watch Manse Orleans for us--"
"Oh, Frieda would be happy to house-sit for you. She has always been gaga over Manse Orleans. You know I would, too, but it sounds like I'll be living on campus for the next four years!" "Yet bet! And we'll be there, too! If you can hold off on mentioning it to Frieda until he finds out that he's decided that this is what he wants to do, that would be good. She likes to talk, y'know." "I understand. She'll want to kill me for keeping secrets from her, but she'll understand when she finds out why." "OK, She, I'm on it! I'll keep you informed as things progress. Codeword, um, 'Detroit'." "'Detroit.' Got it. OK, hon, love you!" "Hi boss, it's Gloria. Better start looking for a new med tech stat. I'm going back to college!" "Thanks. Yeah, I know. But Henry is coming along, and Jana will help out until he's up to par with the ambulance procedures." "OK then! Thanks, boss! You're the greatest!" "Hi Jenny! Hey, I've got a job for The Pearl. Another sub rosa..."
On behalf of Gloria's parents, grandparents, and genetic stock dating back through untold generations, I thank you! In reality, the Baybrace girls were among the first sims I ever made, and I invested an entire day in tweaking their features. They all turned out pretty nice but I'd say that Gloria was the pinnacle of my success with that family. She was the 7th Baybrace, which you can tell from her name. The names of the 7 Baybrace sisters are alphabetized. I was tempted to name them Pleiades. The Seven Sisters, y'know. But I couldn't resist the pun on "Babe Race." *Nowadays he just wants to be a reprobate, but She has her own opinions on that subject. Even then, these characters continue to surprise me, which, I hope, will become increasingly evident as the story unfolds. Last edited by Greg : 06-19-2008 at 11:33 PM. "OK, Honey," She said. "The van is on its way and the kids are all packed up! We're ready to go!" "Great!" Greg said. "I'll call for a car--"
"Oops! No, not a car. Call for the chopper." "What? The heliocoffin? I don't recall there being a helipad anywhere near the university, and if we got to the airfield it's just as far to drive as it would be from here." "Just trust me on this one," She said. "OK, you're the boss!" Hoo boy! I get into more trouble that way! "No, but you thought it!" "Oh, for pity's sake. Is this mind-reading a Captain Hero thing?" "No, it's a blonde thing. Now, just call the chopper! I want you to see the new house while it's still daylight!" 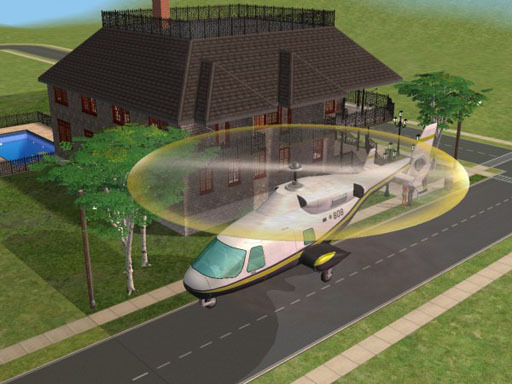 And so, with a hug and kiss for Giles and Frieda, the Bennetts piled the kids into the helicopter and bid a fond farewell to the stately grace of Manse Orleans. Alexander and Amanda were especially subdued. They gazed wistfully out the windows as the helicopter lifted off. Greg leaned close to Her and whispered, "Are the kids OK?" "It's the only home they've ever known," She said. "They'll need some time to adjust." "Yeah," he said. "Me, too." "You're not alone. Our kids were born in that house. We got married there! Memories run deep--"
"I know, sweetheart," he said, holding her close. "Good memories. Lots of good memories." She chuckled. "Remember the hookers in the basement?" "OK, so not all good memories--"
"Oh, I thought they were cute. I just didn't want them in my basement!" "So, tell me about our new place! You've been so mysterious about it--"
"Nope, not until we get there. I want you to see it for yourself." As the helicopter lifted over the mountain ridge south of town, Happy Valley's university district lay spread out before them. They followed the main road toward the university for a few minutes and then began to veer west as they descended. Greg craned his neck, gawking like a tourist. "This is the first time I've seen the Big U from the air. Hey! There's the engineering building! Worth every penny I spent on it! So, which one is ours?" "Do you see the girls' house just ahead?" "Yup. From up here it looks even more like home. I kinda wish we could just move in there, but I don't want to crowd the girls." "OK, look one block west. See the helipad?" He looked. The helipad grew larger in the windshield as they descended toward it. His mind began to encompass all that was their new home. Very gently, she lifted one shapely index finger and pushed his jaw shut. "Holy merde!" he said. "Did you warn the governor he's going to have to move out?" Originally posted Sat May 14, 2005 2:18 pm at the Hullabaloo.